(Bloomberg) -- The U.S. cannabis industry has been severely restricted in its ability to access banking services because of federal prohibition. Two Canadian bank heads say they too will steer clear of the sector until new laws are passed. The STATES Act would exempt the Controlled Substances Act from applying to states that have legalized pot, freeing the industry from the threat of federal prosecution. If passed, many believe this would open stock exchanges and banks to work with the sector. The SAFE Banking Act would allow commercial banks to offer services to pot companies that are in compliance with state law, but wouldn’t change federal prohibition of the drug. Canadian bank executives say they are unlikely to touch the American cannabis industry until the laws change. Unlike their U.S. counterparts, who have virtually no experience in the cannabis industry, some of Canada’s big banks already service Canadian pot companies. Bank of Montreal was the first to do a deal for the industry with a C$201 million ($150 million) equity financing for Canopy Growth Corp. in early 2018 and has since done several others. Bank of Nova Scotia and Royal Bank of Canada have also since advised on takeovers. Bank of Montreal would consider extending its cannabis-banking business to the U.S. only if federal legislation is made more permissive, according to Bloomberg’s Canadian banking reporter Doug Alexander, who covered appearances by the bank executives last week. “We’ll look at it then, but we have nothing in our business plans today that is dependent on pushing our cannabis business into the United States," CEO Darryl White told reporters after the bank’s annual meeting last week. Toronto-Dominion Bank, which has yet to do any investment banking deals or financings for cannabis companies, sees “certain risks with the business, particularly south of the border,” according to CEO Bharat Masrani, who said much of TD’s approach will depend on the outcome of the SAFE Act. Both BMO and TD have significant operations in the U.S.
Canopy, then known as Tweed Inc., was the trailblazer, debuting on Toronto’s TSX Venture Exchange on April 4, 2014 following a reverse takeover of a capital pool company. If you bought in that first day and held on, you would have made over 2,100 percent on your investment. If you sold at the stock’s peak last October, you would have made closer to 3,000 percent. Other pot stocks that will celebrate their five-year anniversaries in 2019 include Cronos Group Inc., Aphria Inc. and Organigram Holdings Inc., all of which have favored investors with significant returns. These returns have also been a boon to the exchange-traded funds that hold the stocks. The two biggest pot ETFs returned more than 45 percent in the first quarter, beating almost all non-leveraged ETFs in North America, according to data compiled by Bloomberg. These funds have also benefited from a less obvious source of returns: lending out their holdings to short sellers. 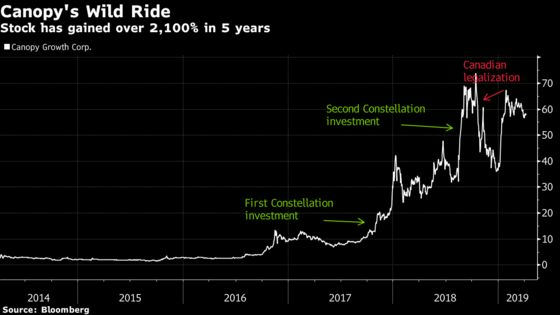 This has been a particularly lucrative practice for pot funds, as many cannabis stocks have a small public float and aren’t readily available to borrow, boosting the fees ETFs can charge for lending them out. This secret sauce netted the Horizons Marijuana Life Sciences Index ETF C$51.5 million in 2018 and boosted its performance by approximately 110 basis points in the first two months of this year, translating into a 7 percent yield on an annualized basis. ETFMG Alternative Harvest ETF, the largest cannabis exchange-traded fund, netted about 2 percentage points or more than $9 million from securities lending in 2018. The practice boosted its overall performance by about 58 basis points in the first quarter of 2019.